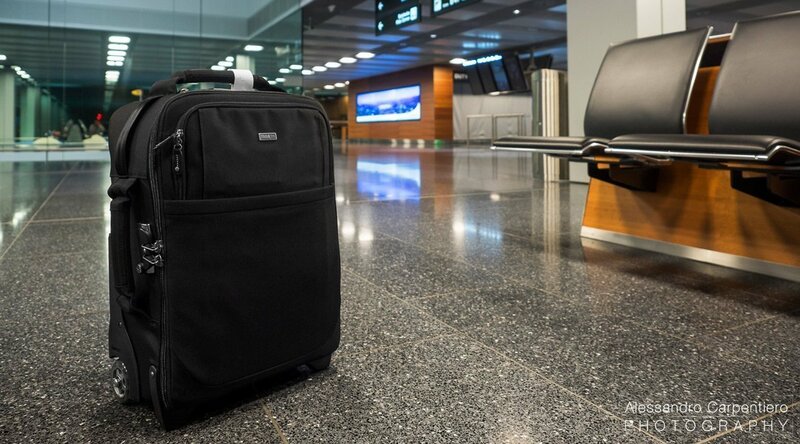 It has a very professional and discrete look, which is a standard from Think Tank. This is something that I much appreciate, as it gives that Pro-Look in front of your clients while keeping you in incognito when traveling. 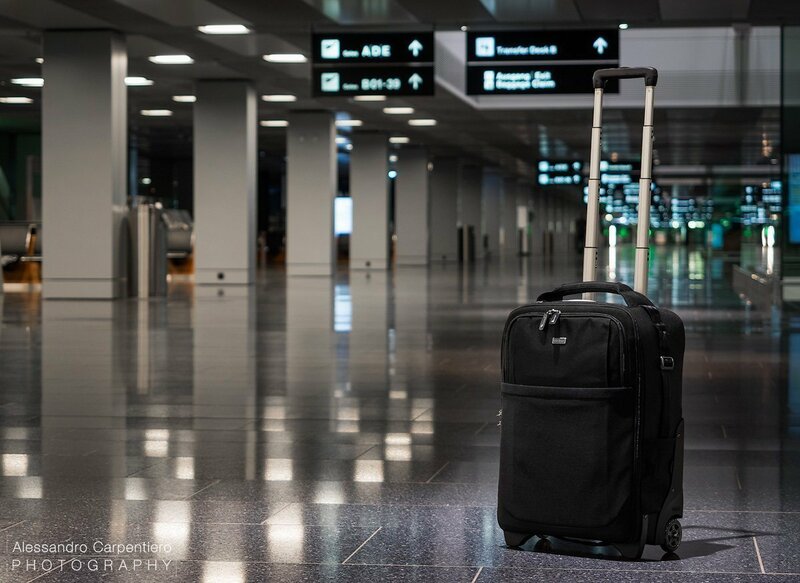 You don’t want everyone to know that you’re carrying a trolley full of photography gear right? It retails $399.75. 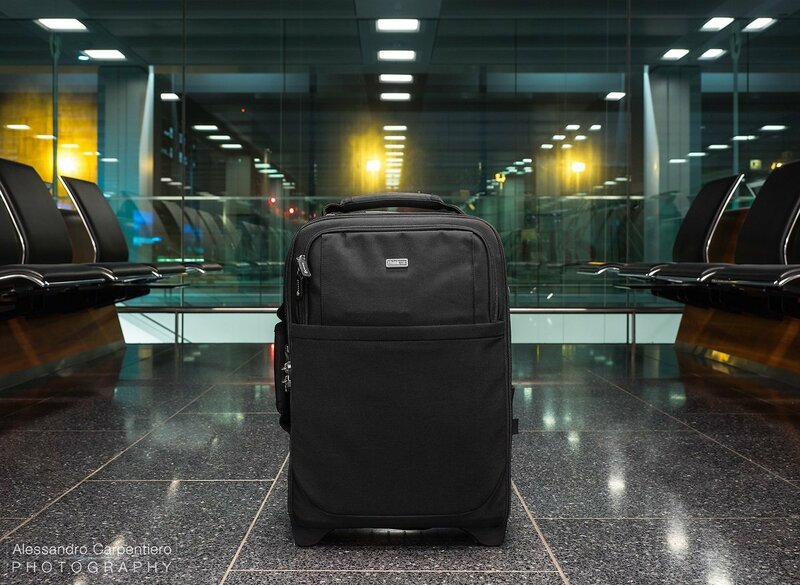 It may seem a bit steep at first, but you’re soon going to find out why this bag is worth every penny. 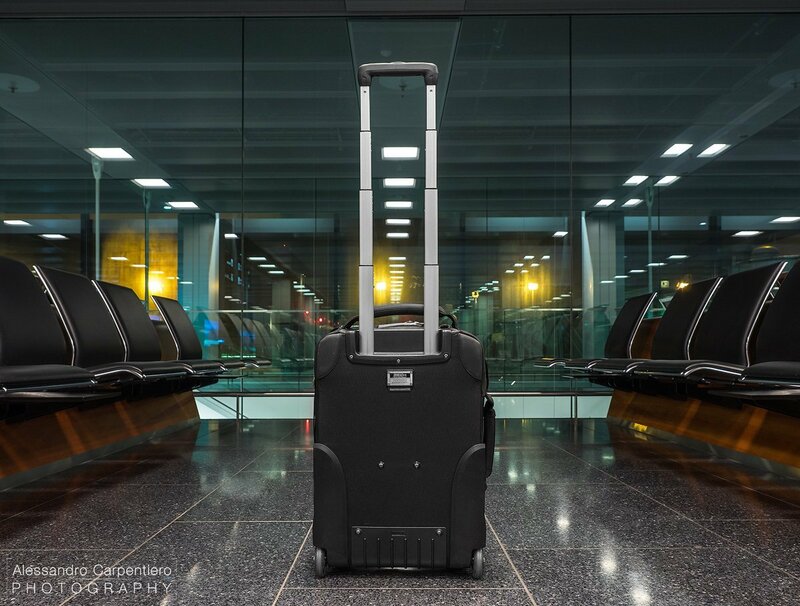 Being part of the “Airport Series“, this rolling case is conceived for being used as a carry-on bag; in fact it meets most International (and U.S.) airline carry-on requirements and it is specifically designed to maximize its interiors. 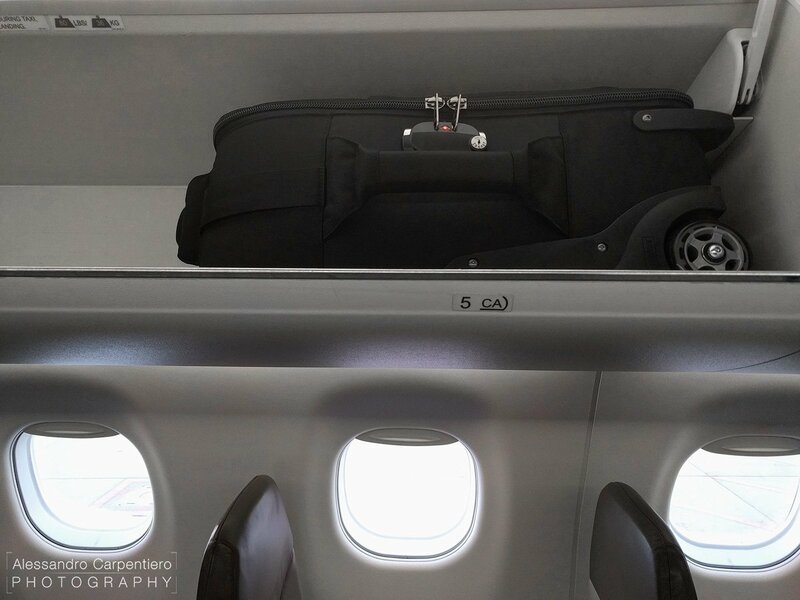 A carry-on must fit in the overhead bin and/or under the seat in front of you. Knowing that, I was a bit afraid when I first boarded a flight from Zurich to Amsterdam: the plane was a Fokker 100, a regional aircraft with not even a hundred of seats and pretty tight bins. I lifted my bag and Ta Dah! I then also tried to put the bag under the seat in front of me, and it did fit. Of course there wouldn’t have been much room left for my legs , but small planes are used for short flights, so that’s ok.
“Under The Seat In Front Of You?” It fits. 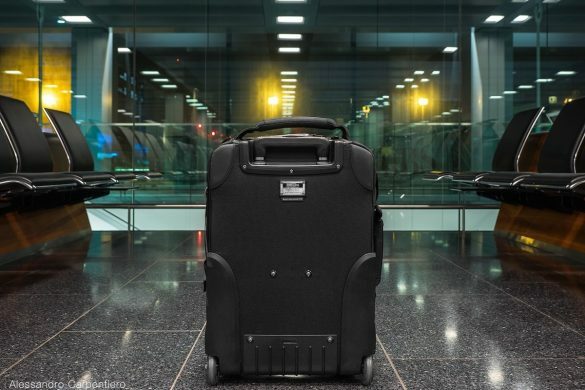 The other fundamental aspect for a carry-on is its weight. Airlines keep lowering this limit and it has become quite frustrating. Emirates for example now has a < 7 kg (15.4 lbs) policy when flying in Economy Class. 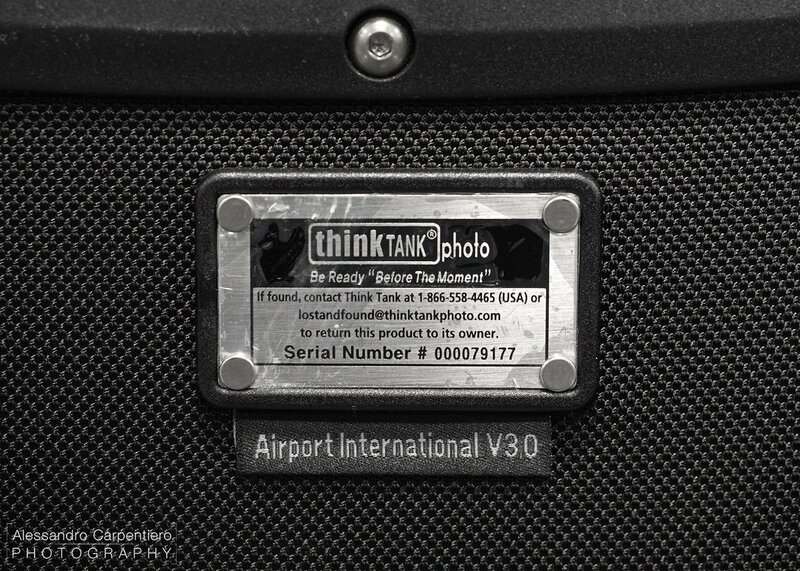 The Think Tank Airport International V3.0 weights between a minimum of 4.4 kg (9.6 lbs) when using only minimal dividers, arriving up to 5.2 kg (11.5 lbs) with all the accessories and dividers (the ones provided are really a lot!). So yes, the bag is pretty heavy. This can be a bit of a bummer for some flights (case and point Emirates), as you may have just 3 kg left for your gear. This means that you won’t be able to carry more than your DSLR and 1 or 2 lenses, even though there will be much free space left. This is one of the reasons why I shoot with mirrorless cameras, as I can save weight and space; but that’s another story. 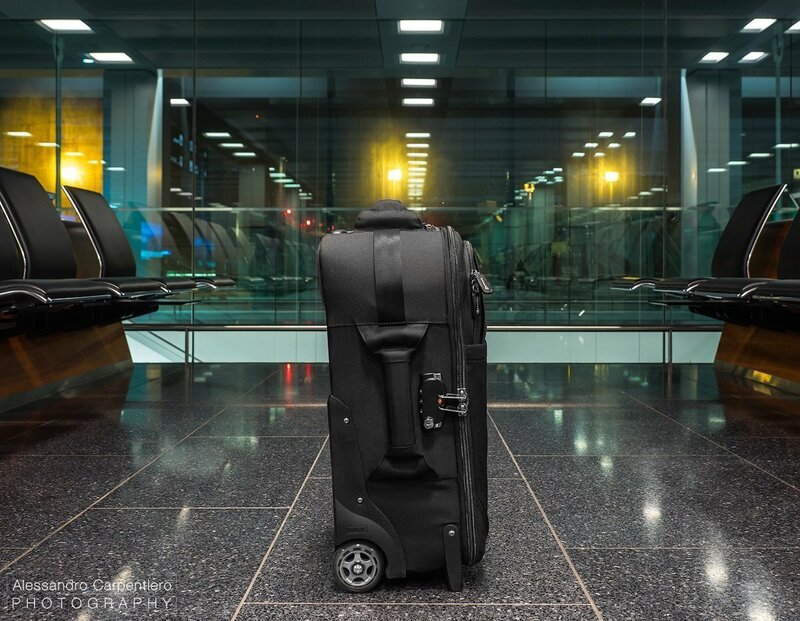 I have personally flown several times with carry-ons which were some kg above the limit, but that was just out of luck and understanding of the airport personell, so make sure to always check your airline for current carry on requirements. So you may be wondering, where does this weight come from? 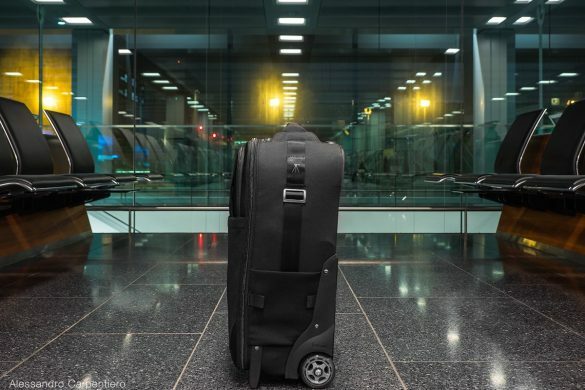 As you would expect from a brand which as the word “Tank” in its name, the built quality is top-notch: the Think Tank Airport International V3.0 is definitely built to last for several years of professional use. The whole product feels extremely sturdy and nothing is left to chance. Just to mention a few, the exterior is made by ballistic nylon with a durable water-repellant (DWR) coating, the zippers are incredibly smooth and abrasion-resistant, while the interior is very well padded, offering protection and support also for heavy gear. 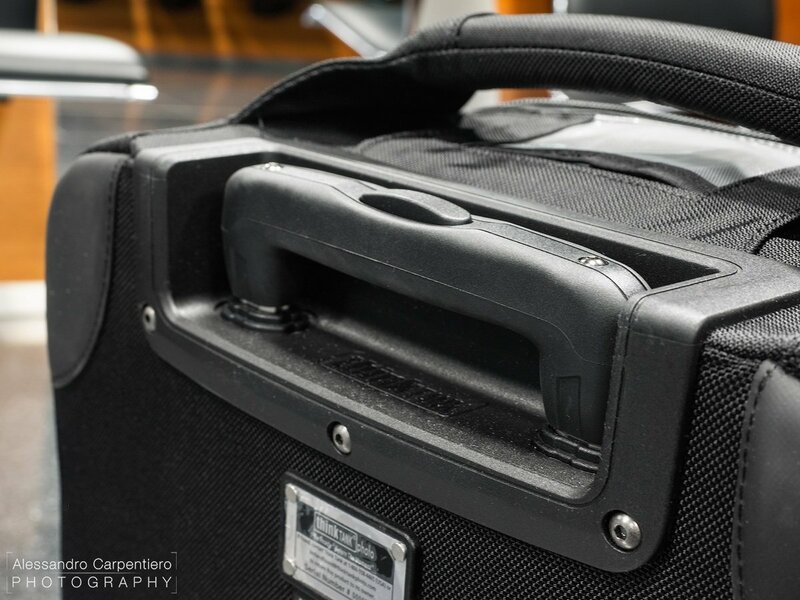 The bottom and back corners are Hypalon reinforced, which is a great thing to have when carrying the case up on a sidewalk. Let’s take a closer look at some of the unique features this bag has. Because remember, perfection is in the details. 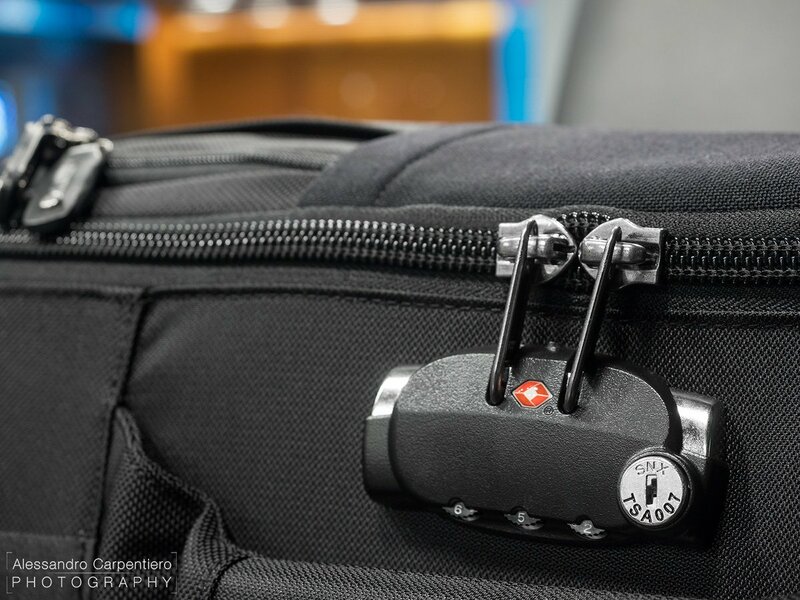 This definitely adds security to the whole product, making you feel more comfortable without having to constantly look at your bag. 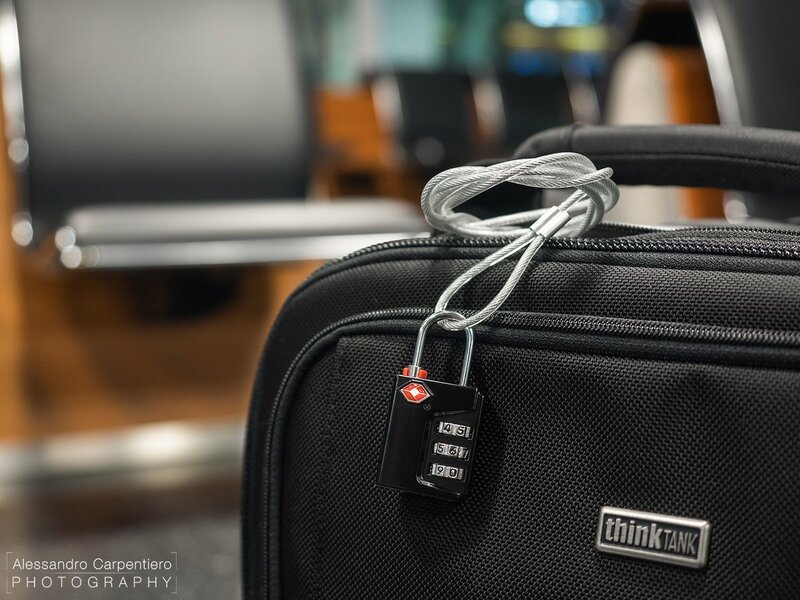 The bag comes with a steel cable which is securely connected to the bag itself, and a TSA travel padlock. This is something that I have incredibly appreciated, and now I’m going to tell you why. 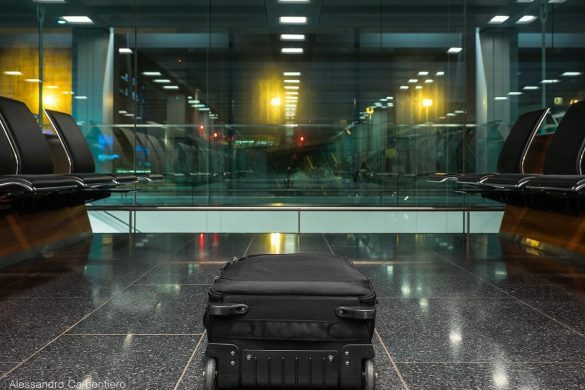 Trips to far destinations, besides being pretty tiring, often have long layovers. When you need to sleep for a few hours (and you can’t find/don’t want to use the airport lockers), the one below is a pretty neat solution. 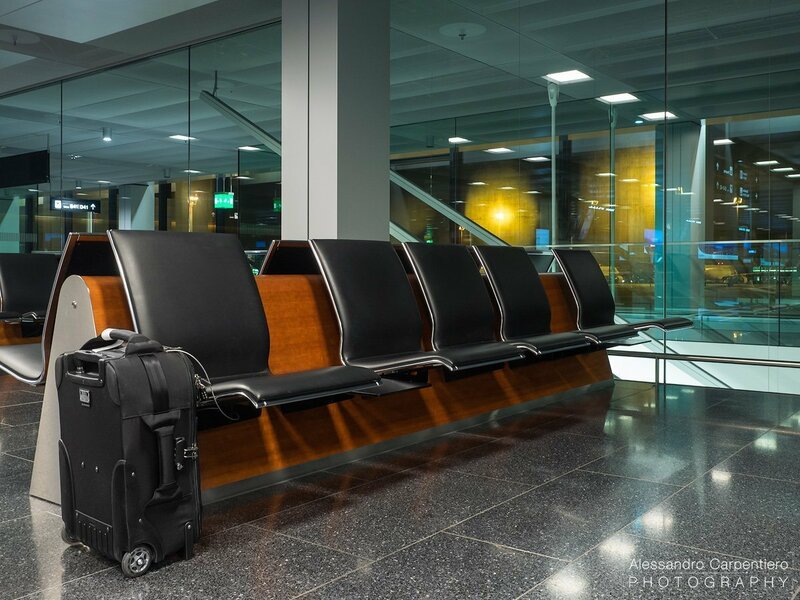 The cable can be connected to an immovable object (in this example to the bench structure) and then locked to the external pocket with the provided TSA padlock. This translates into having all the zippers safely locked, allowing you to have a proper rest without having to worry too much. Quite the king-size bed isn’t it? 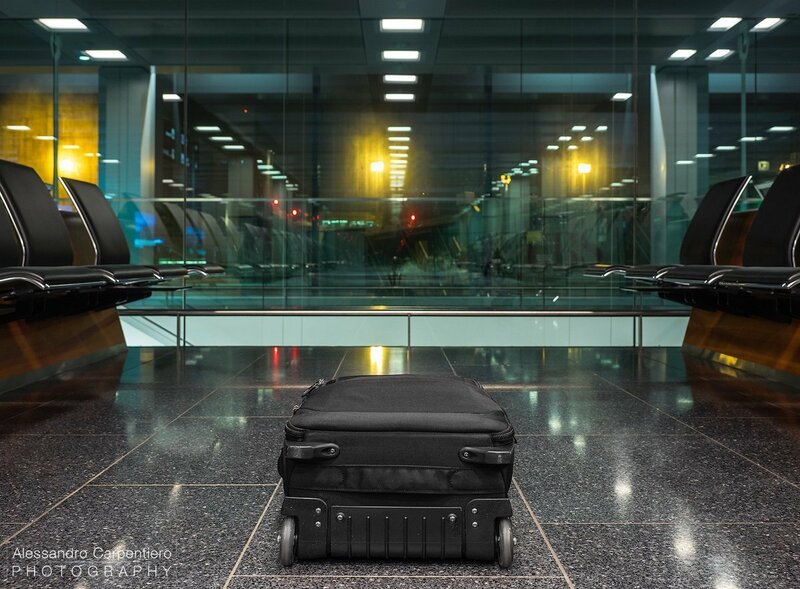 I know, all the rolling cases have one, but I can assure you that the quality of this one is really incredible. It comes out and expands very smoothly and it is pretty long, which makes it easier to drag, drastically reducing the chance of your heel hitting the bag while walking. Another thing that really surprised me is the manufacture of the handles (the one at the top and on the side); they are very tick and solid, making the bag very comfortable to lift. By the way, what’s that Think Tank plate at the bottom of the picture above? Each bag comes with a unique serial number for Lost & Found registration (you have to register your product here after the purchase in order to have it linked to your Think Tank Account). Shall you lose this bag, the plate will allow an honest person to get in touch directly with Think Tank, which will return the product to you. 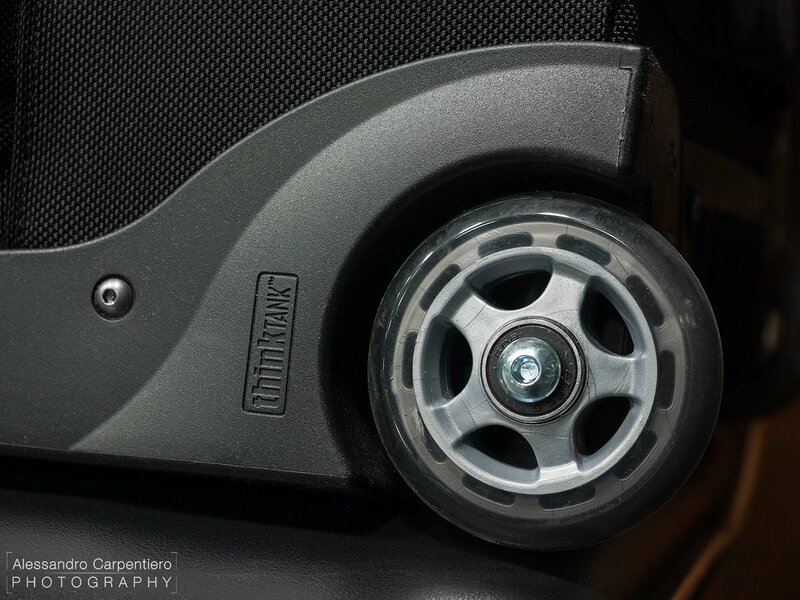 These wheels are really awesome: smooth and silent, making it very easy to drag the carry-on not just around the airport, but also around the streets. 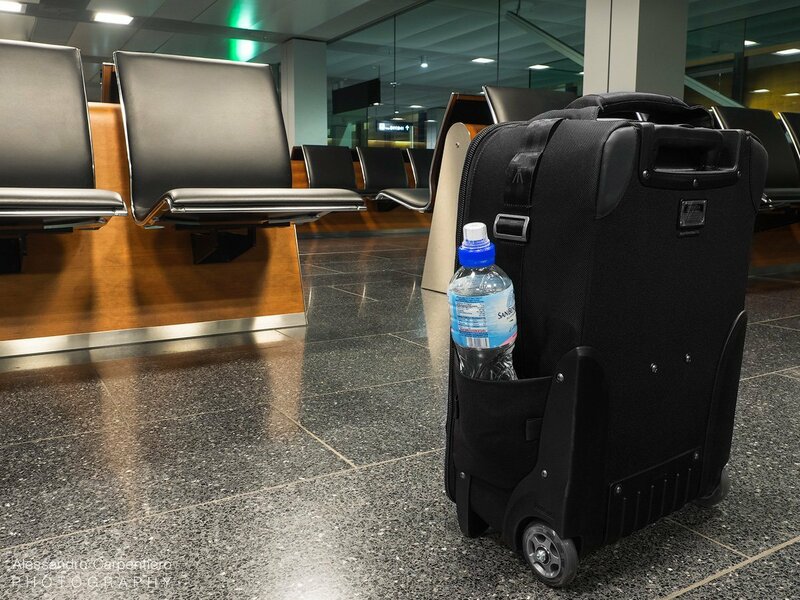 This rolling case has one lateral pocket, which can be used to carry a little tripod or a small bottle of water. 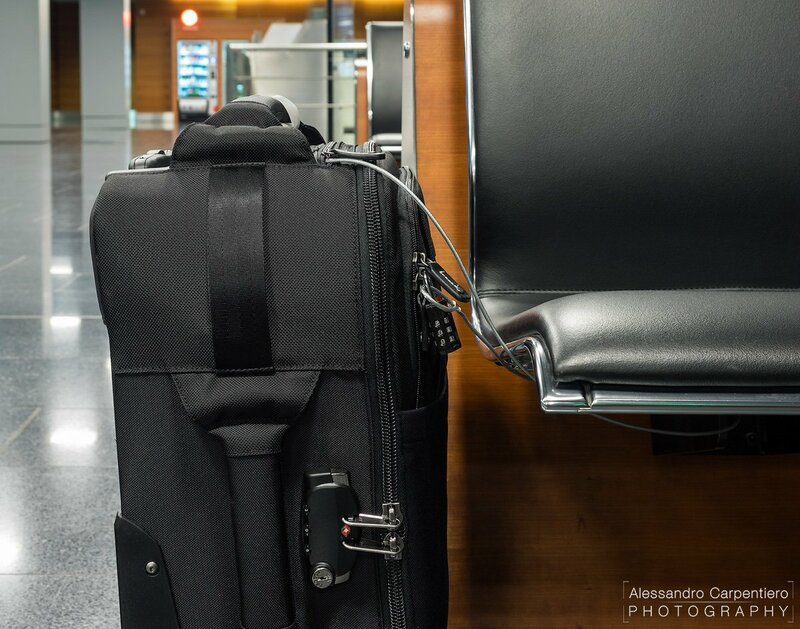 In case you have a bigger tripod, straps are included to firmly secure it to the bag; this is handy when walking around a shooting location, but it’s not that useful at the airport as a big tripod mounted outside would make the bag definitely too bulky. The material with which the pocket is made of is not very elastic, so big bottles won’t fit. On the front side though, things are pretty different. Here we have in fact a huge pocket made with a very elastic material. 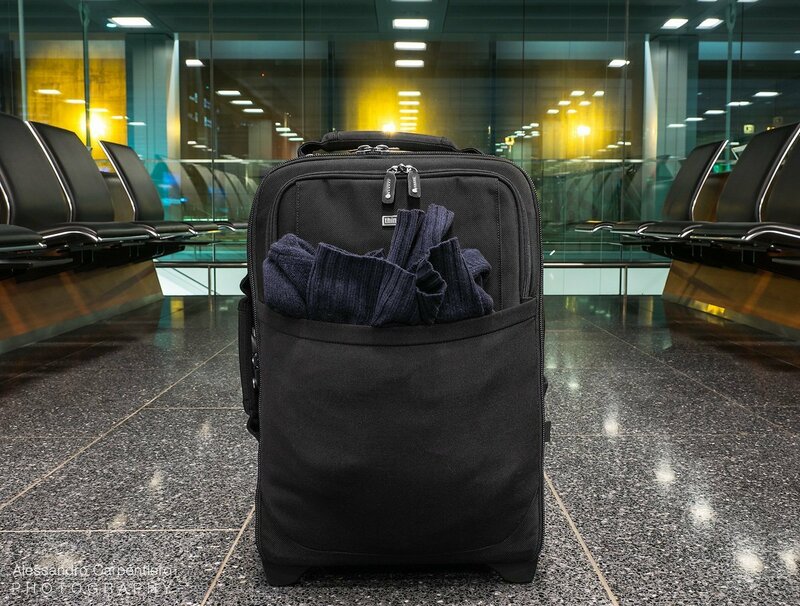 This can be used for storing whatever you might need: a sweater (airports can be pretty cold! ), maps, cables, ecc. 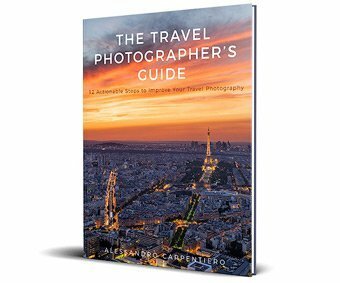 As a Travel Photographer two vital aspects are productivity and backups. That’s why my perfect bag needs to fit a laptop, a tablet and external Hard Drives easily. Guess what? 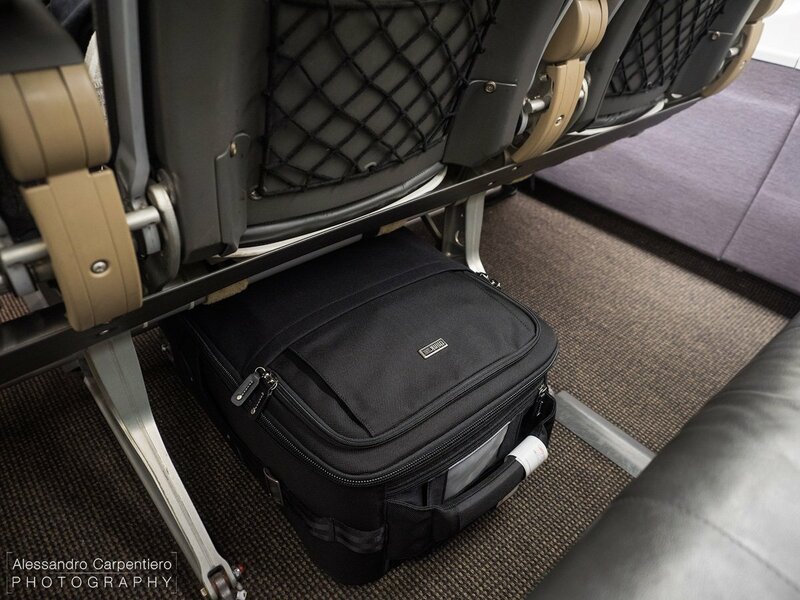 The front pocket, which is the one that can be locked with the padlock you’ve seen above, has room for a 15″ laptop and a 10″ tablet. 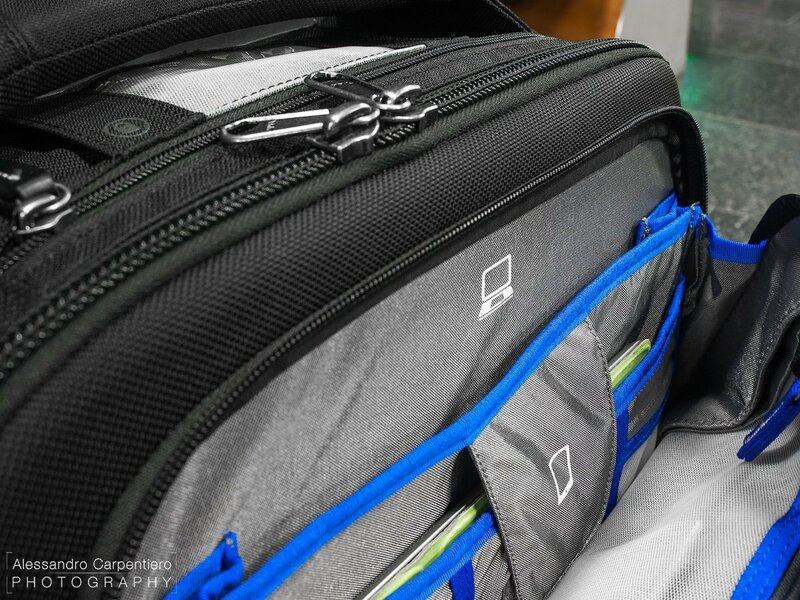 It also has some smaller compartments and a zipper where you can put various little things, such as pens, SD cards and much more. At the top of the bag there’s also a little transparent compartment (you can partially see it in the picture above) designed to fit your business cards. It is quite convenient when attending meetings or on-assignment, but I don’t use it when I am at the airport (incognito mode, remember?). Here Think Tank, I applaud you. 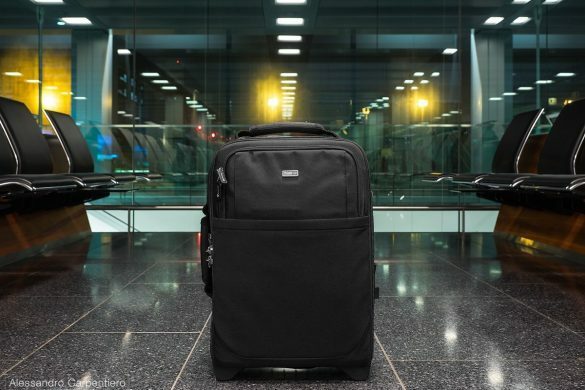 Instead of creating something cheap and not-easy-to-repair (which is what many brands do), Think Tank did the exact opposite: the retractable handle, wheels, wheel housings, feet and kick plate are easily replaceable, which extends the product life, making this bag a truly worth investment. Are you liking what you’re reading so far? If so, please feel free to follow me on Instagram & Facebook! It’s finally time to open this bag to see what I put inside! 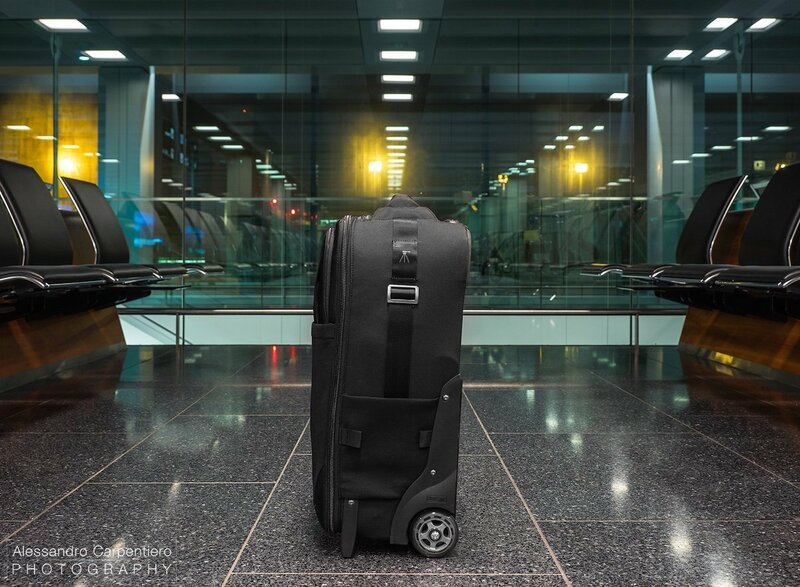 The Think Tank Airport International V3.0 can fit 2 Gripped DSLRs with lenses attached plus 2–4 additional lenses. In case you use very big lenses, for wildlife or sport for example, you will be able to fit maximum the (huge) Canon 500 mm f/4 detached or the 400 mm f/2.8 attached (hood reversed). There are virtually infinite possible configurations for the interiors, thanks to the high number of dividers the bag comes with. What’s that blue pouch? it’s the seam-sealed rain cover, which is an included accessory. 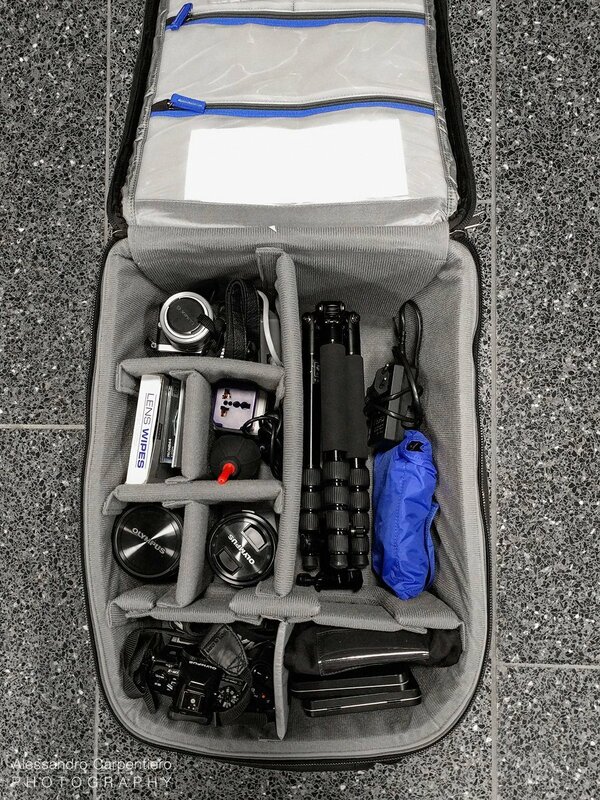 As you can see there’s really a lot of space for your gear! Actually I still had space to pack something else, but I didn’t want to exceed the weight limit of the airline. 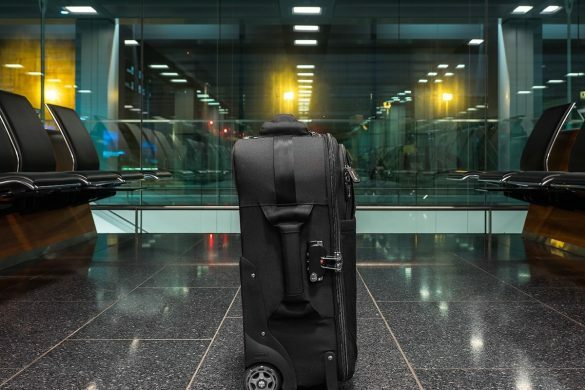 When packing for a trip or an assignment, it’s essential to have a bag which you completely trust: you need to know that your gear, which took time and effort to get, will be safe and easy to carry around. I’ve started to use this bag 2 months ago and it has become my favorite travel bag, which I trust completely. 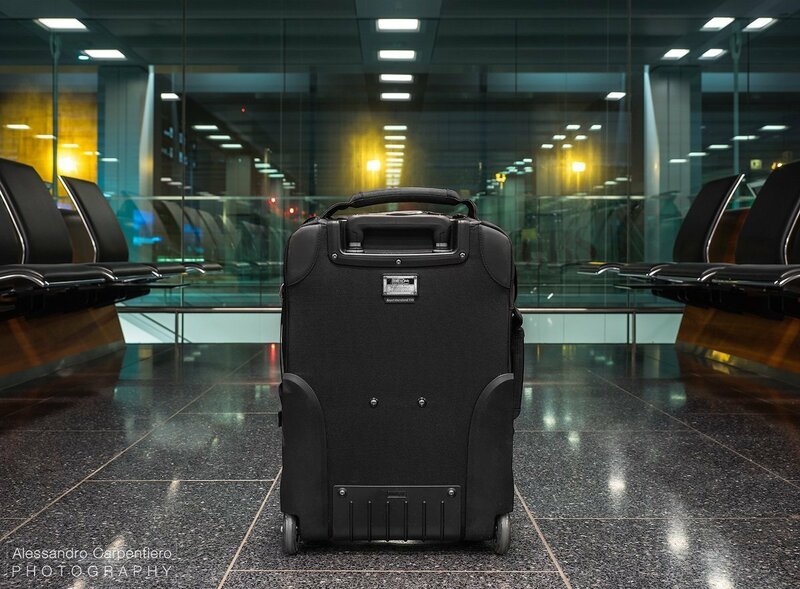 If are also serious about Travel Photography and you are looking for a professional rolling case, then the Think Thank Airport International V3.0 is exactly what you are looking for. If you want to get one, make sure to order it by clicking here (Think Tank website), and you’ll get a free gift and free ground shipping. Not bad right? Otherwise you can order it from Amazon US, Amazon UK and Amazon DE. Do you want to miss some update? Of course not, so make sure to sign-up to my Newsletter in case you haven’t already!